National Security Advisor H.R. 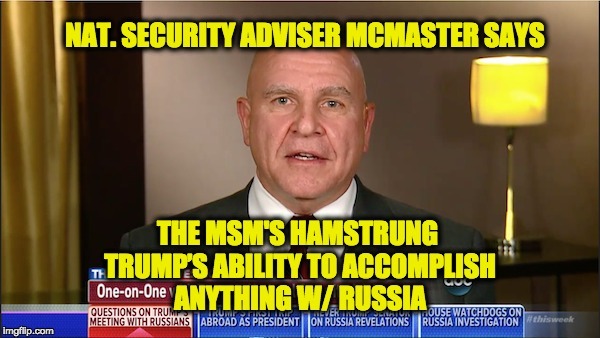 McMaster is an almost universally respected and admired figure in Washington, D.C. and in our military. He was a vastly superior choice (as opposed to his predecessor Michael Flynn) for the position of NSA, and he has worked hard in recent days to ensure the security and safety of the American people. On Sunday, McMaster (who is in Saudi Arabia with the President) appeared on ABC’s This Week with George Stephanopoulos ostensibly to talk about the President’s trip to the Middle East. Sadly, the first 8 minutes of their conversation focused on President Trump’s meeting with the Russian Foreign Minister from last week. McMaster handled the “gotcha” nature of the interview well explaining that nothing about the situation was as problematic as the media seemed intent on pretending it was, an in particular he commented on the fact that the leaks of the meeting had been far more damaging than anything the President had said or done. But McMaster’s thesis on the entire situation is that the media bears much responsibility for the ongoing failures in diplomacy with Russia – because the media narrative and the unhinged way they have gone about attacking the President on Russia has “hamstrung” the President from actually getting anything accomplished on that front. Is that what the president said? H.R. MCMASTER, NATIONAL SECURITY ADVISER: Well I don’t remember exactly what the president said. And the notes that there apparently have I do not think are a direct transcript. But the gist of the conversation was that the president feels as if he is hamstrung in his ability to work with Russia to find areas of cooperation because this has been obviously so much in the news. And that was the intention of that portion of that conversation. STEPHANOPOULOS: Did you know he was going to report that to the Russians? And what did you think when you heard it? STEPHANOPOULOS: The — what you he said about James Comey. That he fired him and why. MCMASTER: Well, the firing had been in the news. But I didn’t know in advance that the president was going to raise it, but as I mentioned he raised it in the context of explaining that he has been — feels as if he’s been unable to find areas of cooperation with Russia, even as he confronts them in key areas where they’re being disruptive, like Syria for example, and the subversive activities across Europe. Their support for the — not only the Assad regime but for Iran and its activities across the Middle East. STEPHANOPOULOS: Did you understand how this might look though to an average American right no? You have the President of the United States telling the Russian foreign minister, in their first meeting, that that the pressure is off because he’s fired the FBI director investigating Russian interference in the campaign. Does that seem appropriate to you? MCMASTER: As you know, it’s very difficult to take a few lines, to take a paragraph out of what are — what appear to be notes of that meeting. And to be able to see the full context of the conversation. As I mentioned last week, the really purpose of the conversation was to confront Russia on areas, as I mentioned, like Ukraine and Syria, their support for Assad and their support for the Iranians. We’re trying to find areas of cooperation in the area of counterterrorism and the campaign against ISIS. And so that was the intent of that conversation was to say what I’d like to do is move beyond all of the Russia news so that we can find areas of cooperation. STEPHANOPOULOS: So, did the president confront them on their interference in our election? This was their first meeting? MCMASTER: Well, there already was too much that’s been leaked from those meetings. And one of the things that I’m most concerned about is the confidence, the confidentiality of those kind of meetings, as you know, are extremely important. And so, I am really concerned about these kind of leaks, because it undermines everybody’s trust in that kind of an environment where you can have frank, candid, and often times unconventional conversations to try to protect American interests and secure the American people. STEPHANOPOULOS: I understand your concern about leaks, but I could an see the — the feeling of perhaps someone likely on your staff or in your community who leaked this thinking they had a duty to leak it because you have this apparent contradiction. The president disparaging the person who was investigating the Russians, but not confronting the Russians who interfered in our election. MCMASTER: Well, as you know, the initial leak that came out was a leak about concerns about revealing intelligence source and methods, information that’s not even part of the president’s briefing. And so in a concern about divulging intelligence, they leaked actually not just the information from the meeting, but also indicated the sources and methods to a newspaper? I mean, it doesn’t make sense, George. STEPHANOPOULOS: I take your point on that, although there’s also the question of whether or not it was right for the president to give that information to the Russians. But I just asked a direct question. Did the president confront the Russians on their interference in our election? MCMASTER: Well, I’m not going to divulge more of that meeting. Those meetings, as you know, are supposed to be privileged. They’re supposed to be confidential. They’re supposed to allow the president and other leaders to have frank exchanges. STEPHANOPOULOS: Well, let me ask just one final question, then, on that meeting. Sean Spicer has spoken out, the president’s press secretary. He said by grandstanding and politicizing the investigation into Russian’s actions, James Comey created unnecessary pressure on our ability to engage and negotiate with Russia. You’re the president’s national security adviser, do you agree that the former FBI’s director grandstanding and politicizing, those are Sean Spicer’s words, hurt our ability to deal with Russia? MCMASTER: I think what’s been hurting our ability to deal with Russia more than any other factor, has been Russia’s behavior. But since President Trump has taken action in Syria, we think that there may be opportunities to find areas of cooperation in places like Ukraine, places like Syria in particular.